How Movies, Books and Paintings Helped Sharks Scare The Crap Out of US! The Painting below is from the Metropolitan Museum of Art in New York image archives (recently opened to the public) and is one of many versions of a painting done by British artist Singleton Copley in 1778. 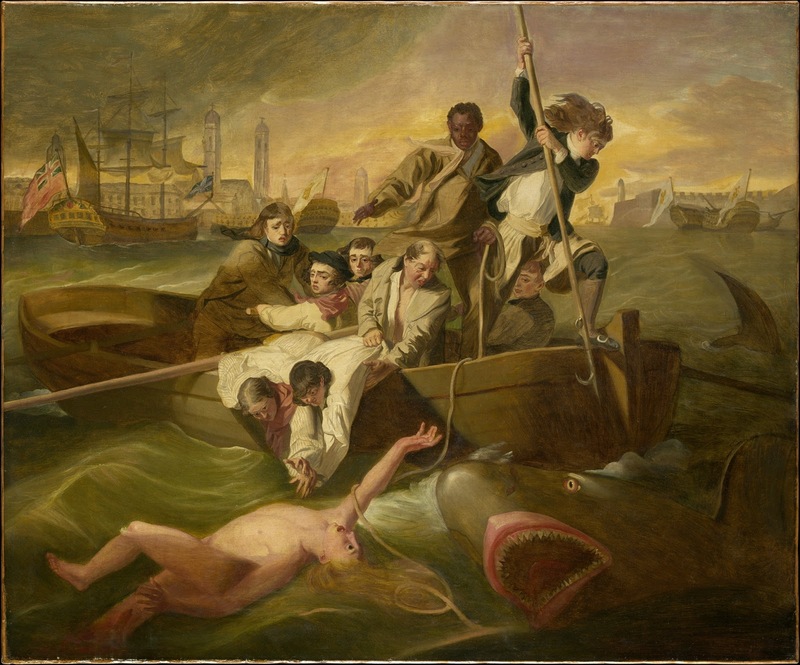 The heroic painting, Watson and the Shark, is based on a real incident that happened in Havana in 1749. Brook Watson, a 14-year old cabin boy fell into the harbour and was attacked by a shark who took off one of this legs. It took three attempts to rescue him. He lived to tell the tale to painter Singleton Copley. The work was such a huge boost to the artist's career that he gave a smaller version of the painting to Watson. It was a very stylized painting and there is a suggestion that the staging in the boat was based on the famous (well here in Canada) Death of General Wolfe by West.